The Penn Libraries have important holdings in both the history of British India and 19th-century diaries. To add to this collection, the Libraries have acquired an additional three personal diaries in the past year, all from the British colonial period. These diaries provide different glimpses into the world of the British Raj. The first of these diaries was commercially produced for the year 1866 by Payne & Co. in Calcutta, and carries handwritten diary entries that note the weather, the author’s health, and social engagements. In addition, there are scores of advertisements of establishments in Calcutta, which offer an exciting view of the period in this erstwhile capital of the Indian Presidencies. The diary has the autograph of someone named “Trevelyn[? ]” and numerous scattered contemporary diary entries in ink in the same hand between March and July, recording the weather and the author’s state of health, familial and social engagements, and religious reflections. It also includes a very early railway map and a brief almanac. The second diary takes a different form, instead of a pre-printed book, it is what we might think of as a blank book used by the author to record his travels. The volume, now UPenn Ms. Coll 938, was used by Alfred E. Cockshott from 1880 to 1936. The youngest of eight children born to Francis P. Cockshott and Jane A. Cockshott, of Islington in London, Alfred married Ada Martha Read in 1899 and they had three children. 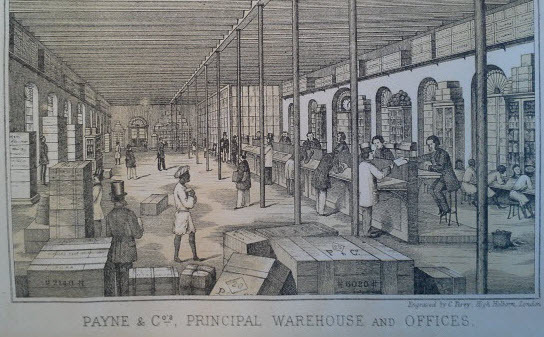 Cockshott most likely worked for the renowned insurer Lloyd’s of London. 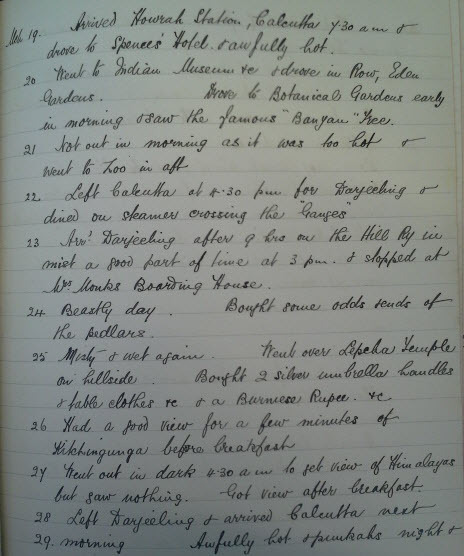 Preceding the first entry in the diary Cockshott provides a half-page list entitled “summer holidays” spanning 1867 to 1879 with a city next to each year. The journal continues with short, descriptive daily entries of each trip Cockshott took throughout his life. The first journey he recorded was in August 1880 when he was just thirteen years old and on a summer vacation with his family. Cockshott provides almost daily entries of his trips. He chiefly travels with family members, mentioning his mother, father, and brothers. In later years he traveled with his wife referring to her by her initials A. M. C. Many of his journeys are to Scotland and places within the United Kingdom. He did however also travel further afield visiting the continent as well as India. One personal note by Cockshott was written while he was in India. He discusses his brother Frank’s illness and recovery from dysentery. The last entry in the journal records a trip to Scotland in 1936 and includes three additional leaves laid in. Occasionally there are notations regarding costs of hotel stays or travel. The diary is written in ink and almost half of the journal is blank. The third of the diaries was kept in 1932 by Rai Sahib Radha Mohan Lal, a judge for the chief court in Jaipur, India. Now UPenn Ms. Coll. 913 The diary is written in a daily-paged calendar displaying the Gregorian date as well as the Sambat, Fasli, and Hijri calendars. 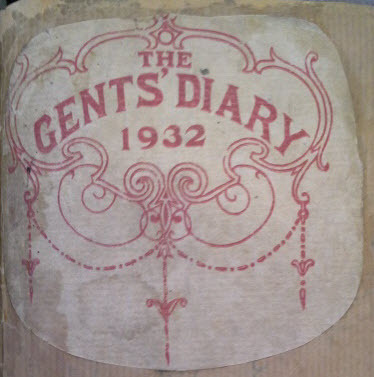 The title page features an attractive paper label reading “The Gents’ Diary, 1932.” The pre-printed portion of the diary includes advertisements on the end papers and a table of contents with common reference information preceding the calendar. Lal’s daily entries record his work schedule, days he is in court hearing cases, or at home writing decisions. He writes of marriage arrangements, obtaining gold pieces, and banking. He also includes details of the travels of his family (including his wife and sons) and friends, their education, and health status, and visits to the hospital. 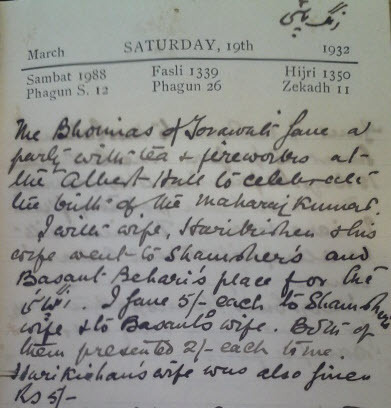 Lal also records the Hindu holidays and some details of the celebrations. 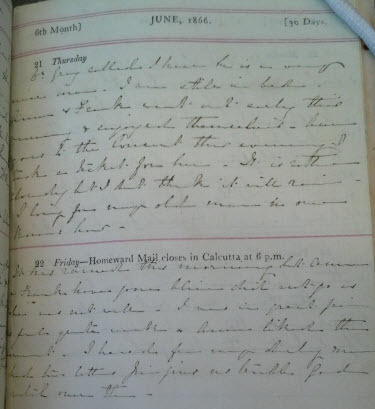 The diary also includes quotidian details about his life, including the receipt of fresh fruit and mangoes, tidbits about his home garden, and news that his cow successfully calved.